It’s coming down to the wire for this year’s 2018 Wacken Metal Battle Canada national final, where one band will be crowned Canadian champion and represent the nation at the international metal battle at the world’s largest metal festival Wacken Open Air in Germany. For this year’s 5th national final, WMBC organizer JJ Tartaglia, whom also runs Boonsdale Records is bringing together two passions as one at the 2nd annual Boonsdale Fest. 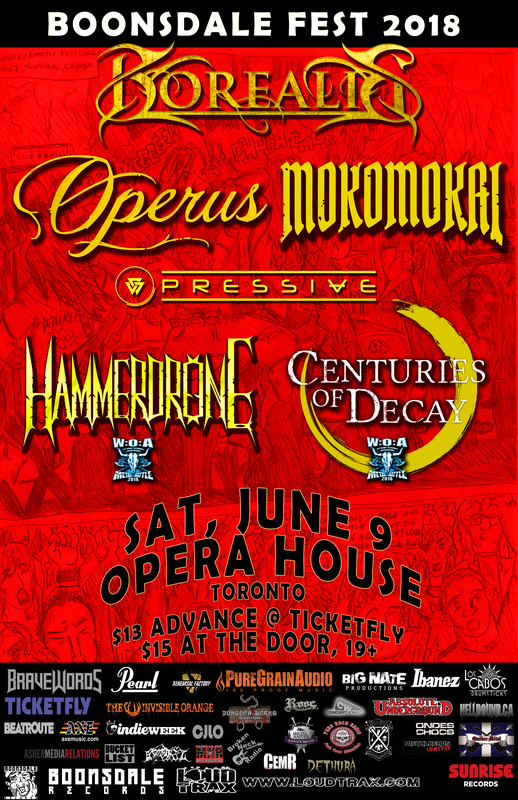 This year’s 2018 Boonsdale Fest will be held on June 9th at the Opera House in Toronto, ON and will feature bands Borealis, Operus, Mokomokai, Pressive, Hammerdrone (WMBC Western finalist) and Centuries of Decay (WMBC Eastern finalist). From 2013 to 2016, Wacken Metal Battle Canada has crowned previous winners Hamilton’s Profaner (2016), Oshawa’s Vesperia (2015), Montreal’s Mutank (2014) and Toronto’s Crimson Shadows (2013) to play Wacken Open Air. Wacken Metal Battle Canada is part of an international competition where over a hundred band’s from across the country battle each other for one to be selected and join over 20 other countries for an international battle of the bands at the world’s largest outdoor metal festival Wacken Open Air, which has been taking place in Wacken , Germany for the last 28 years.